The AERC Convention began today at the Reno Convention Center in Reno Nevada. 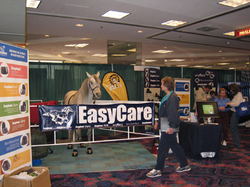 Several members of the EasyCare team traveled to Reno on Thursday to set up. Karen's horse Chief joins the group again this year! We have some exciting things going on in the booth, so be sure to stop by to see what's going on and say hello. We're in booth # 105-107. The show runs Friday February 29th 8 am to 6 pm and Saturday March 1st 8 am to 5 pm. Hope to see you there! The AERC trade show was last weekend in Reno Nevada. This has always been one of my favorite shows as the endurance crowd is such a great group of people. EasyCare has used the sport of endurance as a boot testing ground for over 30 years. Easyboots, Epics and Bares have been used in many of the toughest endurance events in the work. It's not uncommon to see 10-15% of horses in an AERC endurance event fitted with EasyCare hoof boots. Karen, Chief, Brian, Debbie and Cathie attended the show this year. 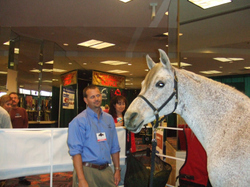 Chief, the equine model, was the 2005 AERC National Mileage Champion and was second in the 2005 $10,000 hoof boot contest. All Chief's 2005 miles were done in EasyBoot Epics. 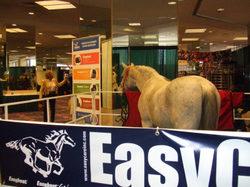 Not many horses can work a trade show inside a casino and perform that way on the trail.